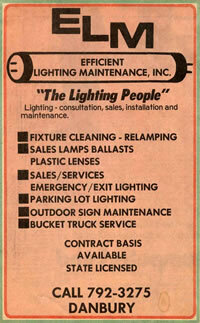 Efficient Lighting & Maintenance (EL&M) was founded in 1981 By Thomas A. Phillips in Danbury, CT.
ELM’s initial purpose was to provide contract maintenance services and lighting programs for its local customers, which is continued to this day. With the growth of national and regional chain stores within mall locations, EL&M expanded its services by working as an agent for many national contract suppliers. Services supplied include electrical repair, installation and maintenance of lighting systems. Sign maintenance and repair were services that were added in the late 1980s to better serve our regional and national accounts. This naturally led into an expansion into the neon repair and signage installation business. In 1999 Energy conservation became EL&M’s main focus. At that time EL&M became one of the few companies in Connecticut to be an approved vendor for both Connecticut Light & Power and United Illuminating in their Small Business Energy Advantage Program (SBEA). The SBEA is administered by the 2 utilities and is funded through Connecticut’s Energy Conservation and Load Management Fund otherwise known as the Connecticut Energy Efficiency Fund (CEEF). EL&M has expanded upon our lighting industry roots to offer a comprehensive solution for our customers need to save electricity. In addition to fluorescent lighting we also provide solutions for refrigeration controls, refrigerated case motors, lighting controls, HVAC and refrigerated case controls, anti-sweat door heat controls and LED lighting. These measures not only add up to significant energy-savings but our turn-key program provides improvements in safety, security and the workplace environment. EL&M today has 3 distinct divisions; An Energy-Savings Retrofit division, A Retail Maintenance electrical and sign repair division and an in-house Neon Glass Repair shop. Our Retrofit Division is a comprehensive, full-service Energy Service Company (ESCO) that specializes in energy-efficient lighting, HVAC and refrigeration upgrades for Commercial businesses and municipal clients located here in Connecticut. Through the use of current technologies available, we help our clients conserve energy. We also assist those same clients in obtaining the maximum rebate and low and zero-percent financing from the utility company. We are proud to say that we are only 1 of a dozen such companies in the state that is able to make this claim. EL&M is committed to helping reduce client liability by handling and recycling universal and hazardous waste in a safe, efficient, cost effective manner that is environmentally sound. We recycle all fluorescent lamps, ballasts, batteries, electronics, mercury and hazardous waste. We are proud to be able to offer these services on an on-going basis for our clients. Our Retail Maintenance division focuses today is much the same as it has been since 1981. We are still a self-performing, full-line retail electrical service company that focuses on the retail business community. We currently work for both retailers directly or through 3rd party vendors as well. We can maintain your facility’s electrical needs long after an energy-saving retrofit has been done. Our Neon Glass Repair Shop does just what it sounds like, we design and repair neon glass. We are proud to have over 70 years of master craftsmanship experience of making neon glass by hand. We are able to repair or build new neon glass signage in any shape or form. Today EL&M Employs around 100 individuals here in Connecticut consisting of our partnerships with our elite sub-contractors, our energy-solution specialists, field auditors, sales force, utility company liaison, office staff, installers, jobsite foreman, delivery driving and warehouse team to name a few.